Stage Services Ltd is a specialist theatre design and installation company based in the UK. Our wide customer base includes primary schools and secondary schools, colleges, universities, theatres, village halls, churches, places of worship, TV studios, entertainment venues, cinemas and leisure centres. We offer a single point of call for consultancy, design, install, commissioning, training, maintenance and service for technical theatre systems such as LED Stage Lighting, Sound Systems and Audio Visual Systems. This allows operators or constructors the opportunity to concentrate other aspects of their programme, safe in the knowledge that the performance infrastructure and technical systems are being handled by the experts. 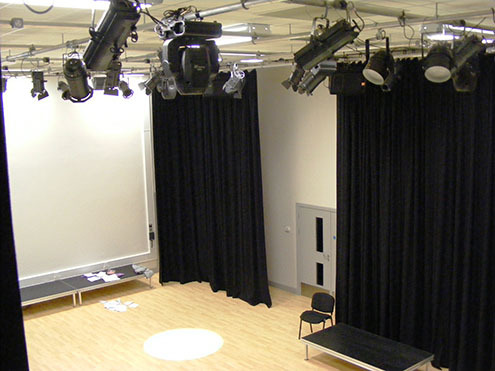 We design and install all aspects of Theatre and Studio technical systems for both new build and refurbishment projects. This includes rigging, LED stage lighting bars and stage lighting grids, dimmers and control desks, distributed digital control infrastructure, auditorium seating, sound systems, PA systems, recording systems, large format screens and projectors, communications systems, curtain tracks, acoustic and masking drapes and acoustic treatments. We can also design, supply and install versatile portable stage systems with or without associated draperies, stage lighting, PA systems and storage facilities. We are able to carry out a complete LED stage lighting installation or upgrade your current system to LED stage lighting providing the benefits of LED stage lighting luminaries, long life, high reliability, low power consumption and reduced year on year costs. All our work is carried out to the highest standards by our own team of installers which includes highly experienced fully qualified electricians, mechanical systems installers and commissioning Engineers who hold PASMA / IPAF and CSCS cards certifications and are DBS checked. We operate a policy of training and certification for our staff in order that once on your site you have peace of mind that the work is carried out safely and on schedule. Our Engineers can service and repair all forms of technical equipment. We can provide on site service calls or if necessary remove the faulty equipment for repair in our Workshop with re installation and test to complete the process. From our warehouse in the south of England, we stock a wide range of professional sound, stage lighting, special effects, portable staging and rigging equipment for hire to add versatility or additional functionality to your existing venue or performance space. 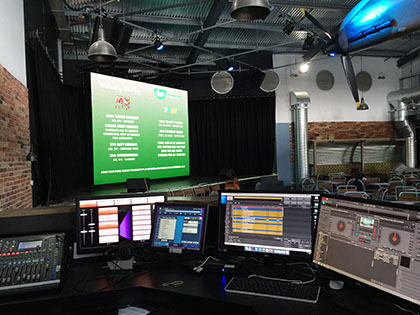 In addition to dry hire we can also provide full technical production for shows, events and award ceremonies allowing you to concentrate on your event rather than the technicalities. Sales of all types of professional sound, stage lighting equipment, rigging, internally wired lighting bars, audio visual equipment, LED stage lighting fixtures, stage curtains, tracks, cycloramas, portable staging solutions, consumables and spare parts. Please contact us for a quotation on 01903 716333 or use our contact us via the web site. 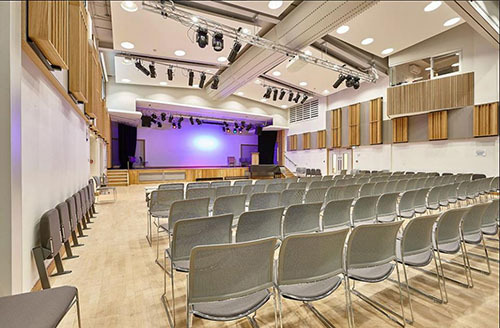 Design and installation of LED stage lighting systems and sound systems for secondary school Performing Art Centres and halls. 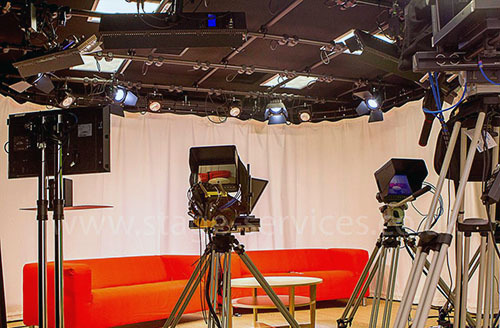 Design and installation of TV studios for both broadcast and education sectors. 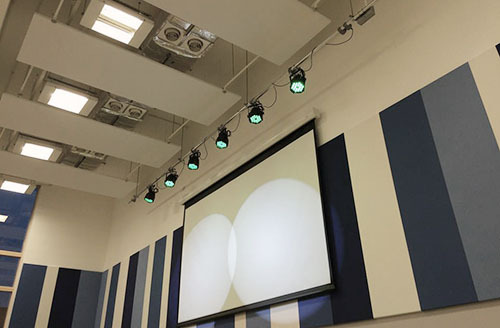 Design and installation of LED stage lighting, Sound system, & projection in primary school hall. Stage Services Ltd was formed in 1994 and specialise in the design and installation of performing arts spaces. 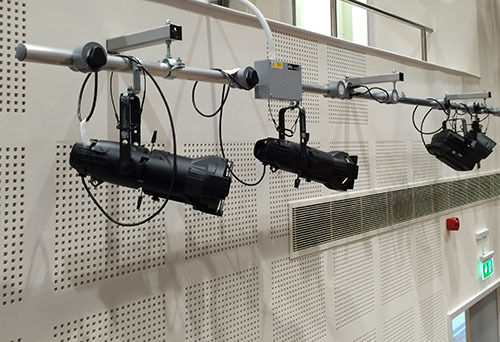 From our base in the South of England we work all over the UK, installing school halls, drama studios, theatres, and entertainment venues with LED stage lighting, sound, rigging and draperies. To date, over 500 projects have been completed. Copyright © Stage Services Ltd, 2018. All rights reserved - Last Update: 20/04/2018, Jon Collins.